Hyperkalemia means too much potassium! This is another major mineral imbalance we are inadvertently imposing on our poor horses. It is very closely tied in with calcium/magnesium imbalances we have learned about already. The more reading a person does on the subject, the more a person becomes convinced that this is the root cause of many of the conditions afflicting our pasture fed horses. Tetany (including convulsions and death in extreme cases). Excess potassium interferes with calcium and magnesium absorption. On top of the fact that soils averagely lack these minerals and rapid growth outstrips uptake, absorption of what little magnesium is ingested can be sabotaged at the last minute by the excess potassium. This information makes for yet another chapter in "The Case Against Rye Grass and Clover for Horses" saga. Rye Grass and Clover have an exceptional affinity for being high in potassium, especially when fertilised with nitrogen, urea or superphosphate, which induce rapid growth during which plants accumulate potassium in their growth tips. "Potassium is concentrated in the fluids inside the cell wall and sodium is concentrated on the outside of the cell. Each time the body has to use a nerve or a muscle, potassium is ejected from the cell and the change in ionic balance sparks an electrical impulse causing the cell to react. It does so by conducting a brain impulse, if it is a nerve cell, a contraction if it is a muscle cell. Once the reaction has occurred, the original cellular balance between sodium and potassium is restored and the nerve or muscle will relax (potassium's relaxing effect inside the cell is similar to magnesium's outside the cell)." Excerpt from, "Minerals: The Metabolic Miracle Workers" by Dr. Robert Erdman and Meiron Jones. A diet that is too high in potassium means that the extra cellular fluid is permanently high in potassium. This upsets the delicate sodium:potassium ratio and amongst other things, putting it simply, the nerves and muscles cannot relax. There is even a condition called Potassium Aggravated Myotonia. Myotonia means 'failure of the muscle to relax' and this is caused by this high potassium on the outside of the cells. Potassium Aggravated Myotonia exactly describes one of my own horses and many of the horses I meet on my travels. It exhibits as a stiffness (can't bend, stiff movement, back legs together when cantering, continual cross-firing or disuniting and a tendency to run off). They warm out of it to an extent. 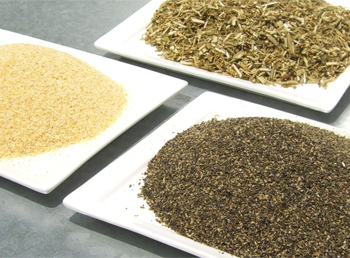 Whilst all of these feeds and herbs can have great benefits, they need to be taken into account when arriving at the sum-total potassium content of your horse's diet. Potassium hydroxide is used in the processing of seaweed. It breaks down all the fibre and is left as a residue of this process. Consequently, kelp is very high in potassium. In the case of horses, potassium is very easily obtained in the diet and is more often than not present in vast excess. Therefore it is important not to add more via the horses vitamin and mineral supplements. On their own (or if your horse is not eating the high-powered pasture as well), these feeds can have benefits but they need to be included in the total potassium content of your horse's diet. Check that your vitamin and mineral supplement does not contain potassium, but also that it does contain sodium which is very necessary to help balance the high potassium intake. A lack of sodium (salt) reduces urination which is how the horse is supposed to excrete this excess potassium. Interestingly enough, soaking hay reduces its potassium content by about 50%2. The only time there would be a necessity for administering potassium would be when the horse is in work and sweating heavily. Hay still contains potassium in good quantities, so no need to worry if your horse is getting little or no grass, they'll be getting the 'right amount' from good grass hay. Interestingly, humans ingest too much sodium and not enough potassium. Most processed foods are full of sodium because we like the taste and cooking food depletes potassium. So we end up with the opposite problem to our horses! 1. The National Academies 2007 Nutrient Requirements of Horses. 2. Katy Watts from Safe Grass. 3. Hyperkalemia by Joyce C. Hollander-Rodriguez, M.D. and James F. Calvert, Jr, M.D. Oregon Health and Science University, Portland, Oregon. In humans, "Some symptoms are said to be irregular or fast heartbeat, paralysis of limbs, drop in blood pressure, convulsions, coma, cardiac arrest, black or bloody stool, diarrhoea, confusion, breathing difficulty, vomiting, extreme fatigue, irregular heart beat, nausea, numbness, tingling hands and feet, and breathing difficult." Excerpt from, "When Blood Potassium is too High" by Charles Weber.